Save 15% now - and get exclusive offers later. for all of life's occasions. with one of our alluring wedding invitations. for everyone on your list. from our wide selection of prestigious designers. Call 1.888.808.3463 or email your request to us. Personalize your items below. When finished click CONTINUE. Sample only; your text will not display. Please Note: Once your order is submitted, the products cannot be changed or cancelled. 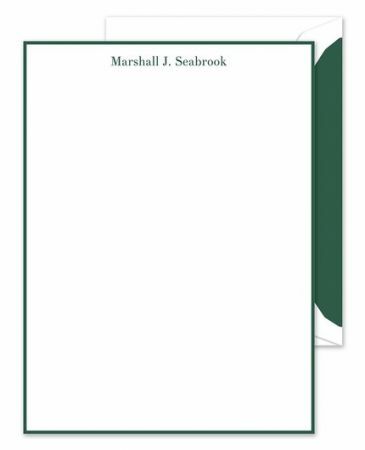 These hand bordered lettersheets are a sophisticated addition to your desk. A bold green border is printed on the edges of this white sheet. Add your personalized text to complete the look. Sign Up for Special Offers, exclusives and More! Many of the names, characters, and images at this site are copyrighted. They may not be copied, reproduced, or used in any form without express written permission.